Vi tilbyder et komplet sortiment af moderne rejsestrømper til mænd og kvinder. Vi sondrer mellem opague, der dækker benene, og transparent, hvor benene er synlige. Strømperne forebygger hævelser og blodamsalinger (kaldet DVT, deep vein thrombosis) på din rejse. Der er en række årsager til at du bør overveje at bruge rejsestrømper når du er på vejse. First, you know from experience that your legs can swell when you expose them to many hours of travelling by car, train, bus or airplane. The legs swell for mainly two reasons, insufficient venous return and hydrostatic pressure, with edema building up. You are uncomfortable. Second, there is a risk of developing a so-called deep vein thrombosis, which is a small clut of blood preventing the normal flow of blood from your legs towards your heart. Third, if your legs swell or get sore and tired due to long hours of walking or standing during your travel, you can reduce the fatigue by wearing our stockings or our therapeutic liquid footbeds (insoles for shoes). We offer both AD knee-high socks and stockings, WITH legs visible (transparent) and WITHOUT legs visible (opague). 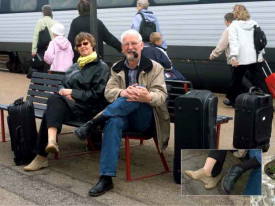 Easy Step Travel & Support are opague, covering the legs completely. These are then typically for both men and women. Easy Step FashionSupport are transparent and therefore typically only for women. Men can wear the AD knee-high though. We offer black in all products and styles. For transparent travel stockings (name: FashionSupport) we offer black and 5 beige/brown variants, from light beige to dark brown. For opague travel socks (name: Travel & Suport) we offer black, dark-blue, brown, beige, white and antracite. We offer the full range of opague and transparent stockings in medium compression (15 mmHg) and high (20 mmHg). If you are in doubt, always use 20 mmHg.